Vista Mare is located in Samaná, one of the most exotic and natural tourist’s destinations of the Dominican Republic. Our project has 60 thousand square meters with two warm and crystalline beaches. It is located on the North of the island, on the Samaná Peninisula, Los Cacaos at just 45 minutes away from El Catey International Airport and at just 35 minutes distance from the main Samaná – Santo Domingo highway. The surroundings offer a place for your comfort and pleasure. This project has various buildings distributed around in different altitudes, guaranteeing a direct view to the spectacular beaches and natural surroundings. 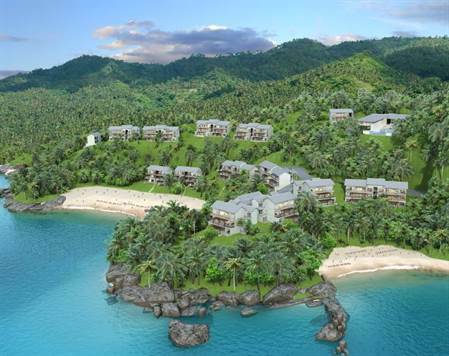 Vista Mare is under construction in Los Naranjos, located between Samana City and Los Cacaos in the Samana Bay, on the peninsula of Samana, northeast in the Dominican Republic. It will be 1 hour away from the new international airport of Samana, now under construction, and to be opened in August 2006. It has an excellent strategic location, being just 10 km away from the city of Samana, and approximately 30 minutes drive from the new golf course “Las Terrenas Country Club” in Las Terrenas, Samana. Boating and fishing facilities can also easily be reached by car. The future highway, which will be ready in two years from now, will connect Santo Domingo Airport in 2,5 hours, instead of the actual 4 hours traveling time. A future path through the property will connect three story buildings, hidden and spread unevenly into the hills. Wonderful untouched flora and fauna with a lot of coconut trees will form part of the surroundings of the apartment blocks. The main road to Las Galeras and to Samana City connects to the property. The entire facility will be landscaped and coordinated to express the local feeling. PRICING, AVAILABILITY AND CONDITIONS MAY CHANGE WITHOUT NOTICE.